Twin Rivers Ranch is located just 18 miles west of Bozeman Montana--90 miles from Yellowstone National Park and it's a great place to spend a getaway. Our goal is to offer an honest retreat from the fast track. We are not a dude ranch, we do not offer schedules with places to be and things to do - however, we want to help you enjoy the west and all of its options. We can provide fly fishing guides, enjoy thousands of acres with no fence line in sight. 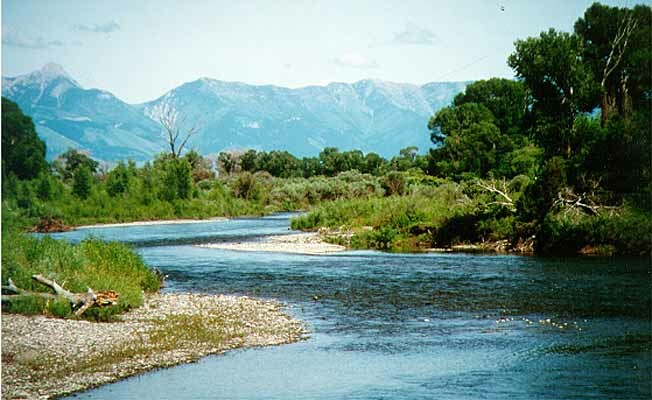 We have wonderful hiking trails and a river that's perfect for fly fishing, floating and family fun. Fall is a great time for game bird hunting. Twin Rivers Ranch offers only four private log cabins. They range in price from $125.00 - $490.00 per night with a two-night minimum stay. Each cabin features hand hewn log furniture, down comforters, full kitchens, bed and bath linens, CD stereo, and endless big sky days and star filled nights.